If you're using BWS, it will download correctly. This mod provides you with higher resolution pics for NPCS and for followers (BG1&2) including (!) for some mods like BG1NPC, Rogue Rebalancing, The White Queen, Tales of the Deep Gardens, Inner Shade, and others. These pics are true to the content. Because some pictures aren't true to lore (I'm looking at you mods) I address this problem with "The Picture - Alternative" which replaces some of the immersion breaking pics. In other words: The alternative pack is highly recommended. This mod is or should be the picture standard for BGEE. If you find something better, then by all means: use that. But don't fall below this standard. So far done: 500+. Note: ALL companions, BGEE1 and BGEE2 are downloadable via TPS - Followers. We start here with a misconception: the ol' BG had three files (L, M, S,). Accordingly you also need to provide three file sizes for BGEE. WRONG. BGEE can scale any picture size down or up. Let's say you're playing BGEE on a 1080p monitor like me, you'll realize your eyes start to bleed whenever a npc portrait pops up. That's because BGEE upscales the smallest files to fit the screen resolution, instead of downscaling larger files. This results into blurry portraits, which can cause, by merely looking at them, permanent eyesight reduction. Not to play BGEE is out of the question. Warriors and barbarians will not mind damaging their eyes, as long as treasure huntin' and fun is to be had. But we're not all warriors. Some are already half-blind like me, and worry that further exposure will lead to the need of a blindman's stick and worst of all, not being able to play games anymore. So I've taken up the liberty in providing you with higher resolution npc pics and the standard follower pics. Please note that although I did find almost all pictures, some evaded me and therefore I was forced to use an upscalling method in photoshop (including some tweaks). The outcome is better than the original, but not as optimal as I would want it (which would mean that they had to be perfect...). Check out the difference in the screenshots. 1. Make a backup of portraits in the override folder. 2. 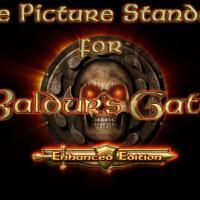 Install The Picture Standard - Vanilla by dropping the pictures from the 'Override'-folder into your 'override'-folder (wherever you installed the game). 3. I recommend installing the TPS - Follower folder also, since you probably don't have seperate pics for all others. Over this you can then install - if you want to - your own party pics. This step makes sure that, all pics are the higher versions. Just make sure the M and S pics are 210x330. 4. Optional but highly recommended: I also provided the TPS - Alternative, which gives you some new lorefriendly pics. BUT ALWAYS INSTALL THE TPS - VANILLA FIRST! 5. Updating: First drop the new Vanilla content into your override folder, click 'yes' to let it overwrite. Then - if you want to - do the same with the alternative. 6. Uninstall by deleting them. Will you offer further assistance? Probably not as much as I'd like to. Firstly, I created this mod for my own pleasure and (!) health. Secondly, I work a lot and would like to use my time for gaming. This picture pack works. 2. Ignore what they say about the size. Any pic you plan to use, make sure it has the size 210x330 because the game by itself can and will downscale. 3. LARGE pics are for character creation, Medium for character record and Small for the right sidebar and speech popups. 4. Again: Always make sure your L, M, S pics have this resolution: 210x330. 5. For best perspectives try this: L = almost full body; M = Torso; S = Portrait. Because of mostly low picture quality I was not able to always do this and had to use the torso perspective for S, except for a few like: GARZOM*. So that could be your reference pic. 6. Quick'n'dirty would mean: Copy your large follower pic (the 210x33) and rename the ending to M and S. So you will have always clear pics. Credits: To all who actually drew or otherwise made these pictures. The Picture Standard - "Go for the Eyes Bo!" P.S. I've provided 114 alternative pictures, which inlcude all missing ones and more. If you're not satisfied with the alternatives, just overwrite with the content of the vanilla folder. Or choose the ones you want manually. It's a real easy process. For all looking for the newest files, there in the meantime on: http://www.nexusmods...ate2ee/mods/9/? until the upload works here again. Sorry for the inconvience. So, is there any other mod I should update? Indeed! But we can remedy that since the engine allows us to. Please remove the pictures for Gavin and the BG1NPC project. In both mods itself, the portraits were removed because of missing copyright status.